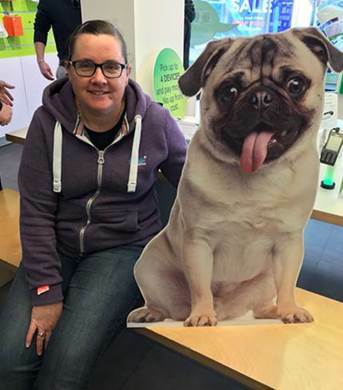 A cardboard cut-out of a Pug dog on display in the window of JT’s Queen Street store has been auctioned off. This has kick-started JT’s 2017 charity campaign to support charities linked to Alzheimer’s Disease. On social media the two-dimensional dog generated a lot of interest on JT’s Facebook page. 100’s of followers asked if they could have the two-foot pooch once it had finished its duty of promoting JT’s New JT One campaign. JT decided to auction off the pug on Facebook. And, Kirsten Murphy became the proud new owner with her winning £35 bid. The cut-out featured in her daughter’s birthday celebrations. 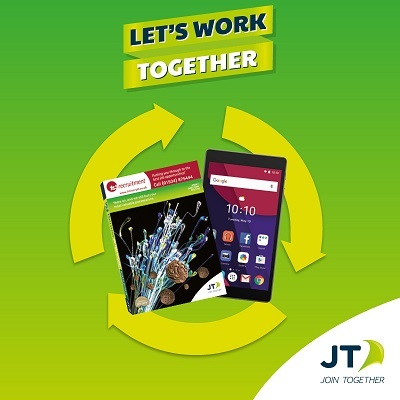 Running until next March, JT’s 2017 fundraising drive will support Jersey Alzheimer’s Association and Guernsey Alzheimer’s Association. Plus, other related charities in London, Melbourne and Boston, where JT also has offices. The fundraising target this year £20,000. Christophe Chateau, JT Group Head of Culture and Staff Engagement, said: “What better way to launch a charity campaign than by finding a new owner for dog in need of a home. In all seriousness, though, JT has a proud record of supporting local charities. Kirsten’s donation gets the ball rolling. Last year, we raised over £25,000 for baby-related charities. I’m sure our amazing people will raise a similar amount for charities supporting islanders with Alzheimer’s Disease. This is the most common type of dementia and more prevalent as the numbers of elderly people increase.